The Consortium of Higher Education LGBT Resource Professionals condemns the action taken by the Trump administration in denying the civil rights of transgender students across the nation. The Trump administration recently rescinded the "Dear Colleague Letter on Transgender Students" that gave guidance to educational institutions on how to support trans students. The Consortium and its members who staff LGBTQ campus centers work to empower, build safety for, and affirm trans, genderqueer, and non-binary students, staff, and faculty on college and university campuses, and we will continue to do so. "How Colleges Can Still Legally Protect Trans Students without Coverage under Title IX" written by Genny Beemyn, former Consortium Co-Chair, and D.A. Dirks, current Consortium Co-Chair. National Center for Transgender Equality "FAQ on the Withdrawal of Federal Guidance on Transgender Students"
Consortium of Higher Education LGBT Resource Professionals "Suggested Best Practices for Supporting Trans Students"
Consortium of Higher Education LGBT Resource Professionals "Recommendations for Supporting Trans and Queer Students of Color"
The Consortium Executive Board recognizes this is a dire landscape for trans students and professionals, and we see you and value the lives and labor of trans people in this work. We are here to provide assistance and guidance, and please reach out to us and colleagues as support and resources in this critical campus equity work. Please join the Consortium of Higher Education LGBT Resource Professionals in celebrating our 20 year anniversary at Creating Change 2017 in Philadelphia! Cash bar, free appetizers & birthday cake! The Institute will feature a morning speaker, regions meeting time, lunch on your own, roundtable discussions in the afternoon, and wrap-up with a mix and mingle opportunity for members to network. If you are attending the institute, please use this link to provide additional information to the Consortium for Thursday's Institute. Consortium Suite Hotel Room: TBA--We will update this page with the Consortium suite on Wednesday once we know the location. It will also be announced at the Consortium Business Meeting Wednesday Night. 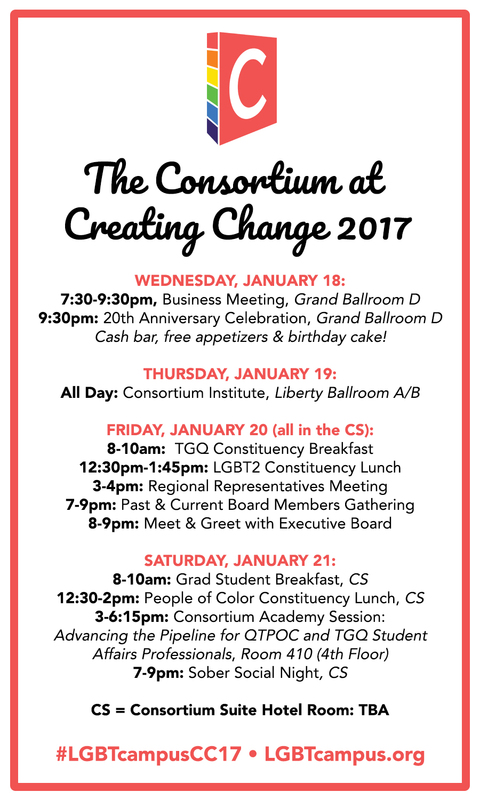 Follow Consortium discussions at Creating Change with #lgbtcampusCC17 and we look forward to seeing you in Philadelphia! Would you like to bring the Consortium board to your campus? We are pleased to announce the Consortium's invitation for proposals to host the 2017 Day-Long Summer Institute! Your campus could host a professional development opportunity for your region. Since 2009, the Consortium board has hosted a summer planning retreat at different campuses across the U.S. including University at Albany-SUNY and University of Nebraska-Lincoln. Before the retreat, we have hosted a Consortium Summer Institute with the host institution. Since the retreat travels, we would like to take the retreat and institute to a new location where it can benefit our members. In the attached document (also found online at http://bit.ly/2017instituteProposal), you will find descriptions of the Institute and the partnership between the hosting institution and the Consortium. The detailed proposal form (pgs 3 - 7 of the attachment) includes an opportunity to outline proposed dates, venue(s), logistics and much more. Consider inviting the Consortium board to your campus in Summer 2017. The deadline for proposals is Friday, December 16, 2016! What questions do you have? The community of LGBTQ higher education resource professionals is comprised of a vast array of dedicated individuals committed to enriching the lives and campus climates for LGBTQ people. It is only appropriate that we are able to recognize the durable and sustainable impact that we all have at our institutions. Last year, the Consortium community recognized Dr. Debbie Bazarsky, Dr. Cara Miller, and Nicholas Shigeru Sakurai for their achievements in the work. These awards, presented at Creating Change in Chicago, continue to mark milestones for the Consortium in its goal to recognize those who have, and who continue to, create change. The award for distinguished achievement in the profession recognizes and honors individuals whose work has attained preeminence in lesbian, gay, bisexual and transgender services and programs in higher education. This work includes areas related to practice and policy, research and theory, as well as programs and service. The work exemplifies the profession, and is represented by a broad scope of activities and accomplishments. Completed nomination materials are due by end of business on Monday, October 31, 2016. Materials should be emailed to Meg Evans at [email protected]. The nominator will receive a confirmation email once the submitted materials have been received and processed. Review of materials will take place during the first few weeks of November and notifications to awardees will occur no later than December 1, 2016. Awards will be presented during Creating Change in Philadelphia. Thank you for your consideration and participation as we strive to recognize the important work of our colleagues across our profession. The Consortium of Higher Education LGBT Resource Professionals enthusiastically endorses H.R. 6164, the Inclusive Campuses Act of 2016, which was introduced this week by U.S. Representative Hank Johnson (GA-4). If passed into law, this measure would promote inclusion and empowerment of LGBTQ people at Historically Black Colleges and Universities (HBCUs) and other minority serving institutions. This federal legislation would take a critical step forward by authorizing Title III education funds to establish campus resource centers that provide support for LGBTQ students as well as programming resources and education about LGBTQ people to the entire campus community at our nation’s HBCUs and other minority serving institutions. “The Consortium of Higher Education LGBT Resource Professionals was happy to work with Rep. Johnson on the drafting of this legislation and we look forward to enhancing our own membership support for the work of LGBTQ campus resource centers at HBCUs and other minority serving institutions,” said D.A. Dirks, Co-Chair of the Consortium of Higher Education LGBT Resource Professionals.